Traveling back from the Indiana over the weekend, we stopped off in Forrest City, Arkansas, and there had dinner at the Ole Sawmill Cafe. 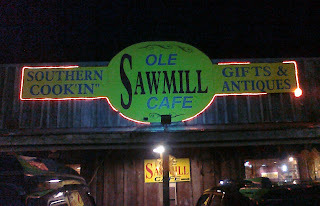 The down-home southern cooking was fine, but the quotation mark usage left a lot to be desired. Just FYI, "Forrest City" is pronounced "Far City." This has nothing to do with the bent of your post; it's just something that I know.